This will be a favorable year to look for the Leonid meteor shower because the moon will be only crescent and will have set in the west long before the constellation Leo begins to rise into the night sky. The Leonids appear to radiate out of Leo, the shower's namesake, and with the moon out of the sky completely, viewing conditions could be perfect for stargazers with clear weather and dark skies. The Leonid meteors are debris shed into space by the comet Tempel-Tuttle, which swings through the inner solar system at intervals of 33 years. With each visit the comet leaves behind a trail of dust in its wake. Much of the comet’s old dusty trails litter the mid-November part of Earth’s orbit and the Earth glides through this debris zone every year. Occasionally, Earth passes directly through an unusually concentrated dust trail, or filament, which can spark a meteor storm resulting in thousands of meteors per hour. That’s what happened in 1999, 2001 and 2002. Since the Tempel-Tuttle comet passed the sun in 1998, it was in those years immediately following its passage that the Leonids put on their best show. But now, the comet and its dense trails of dust have all receded far outside Earth's orbit and back into the outer regions of the solar system. So odds are that there is little chance of any unusual meteor activity. In the 2012 Observer’s Handbook of the Royal Astronomical Society of Canada, meteor experts Margaret Campbell-Brown and Peter Brown, indicate that this year’s peak activity should occur on Saturday morning, Nov. 17, at about 3 a.m. ET (0800 GMT). This is the moment when the Earth will be passing closest to the orbit of the long-departed comet, and when our planet seemingly is most likely to encounter some residual comet material. This time is highly favorable for North Americans, especially those in the eastern United States and eastern Canada. 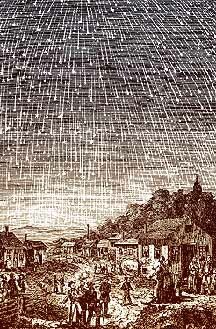 But while Leonid rates are unpredictable, it is unlikely that more than 10 to 20 meteors per hour may be seen this year. Other meteor researchers, however, such as Jeremie Vaubaillon of France, and Mikhail Maslovof Russia have examined Leonid prospects for this year and also suggest watching for some meteor activity three days later, on Tuesday morning, Nov. 20. Although the Earth will pass almost directly through the center of this supposed cloud of comet dust, the fact that it is situated far from the parent comet, plus gravitational perturbations affecting these particles after making 18 trips around the Sun, dictate that any meteor activity will be sparse at best. Eastern North America appears to be in the best position to see any possible Leonid activity. Because the Leonids are moving along in their orbit around the sun in a direction opposite to that of Earth, they slam into our atmosphere nearly head-on, resulting in the fastest meteor velocities possible: 45 miles per second. Such speeds tend to produce bright meteors, which leave long-lasting streaks or trains in their wake. Thank you to the volunteer staff at Justinen Creative Group for creating and hosting this site. Sponsored by Justinen Creative Group Inc. Copyright ©2010 Justinen Creative Group Inc. All rights reserved.